My oldest son Konnor is much our artist. Talented in music and art. He draws his heart out everyday. He is so good at drawing his own comics. This summer his goal was to create his own comic book. Not only did he draw and illustrate one, he did two! 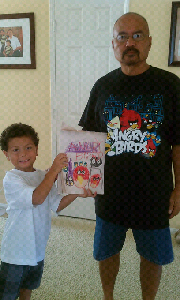 Here he is with a drawing he did, replicating his Papa's (My Dad) Angry Bird Tshirt. That is an awesome drawing! 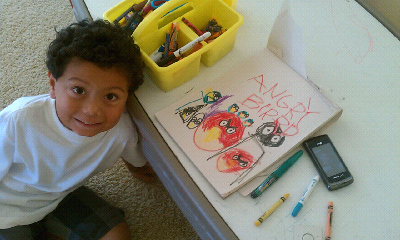 My son loves the Angry Birds too.